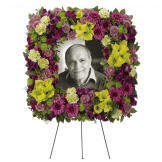 This square wreath is a classic way to share a treasured photo, and your memories with others. Pretty blossoms and greenery create a beautiful framework for your tribute. 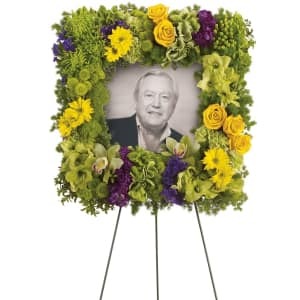 • Stunning flowers such as hydrangea, dazzling green cymbidium orchids, roses, gladioli, bells of Ireland and more make this an incredible display of respect. • Can be sent by family, and friends. 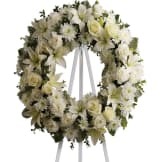 • Wreath measures 22" W X 22" H.
Flowers will be received by a Joiner Anderson Funeral Home's staff. 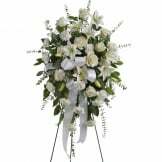 All of our flowers are designed and delivered by hand from a local florist in in Statesboro.